Soups are prepared in many different ways but, most soups are made with finely chopped vegetables such as carrots, cabbages, capsicums, mushrooms, beans and spring onions. 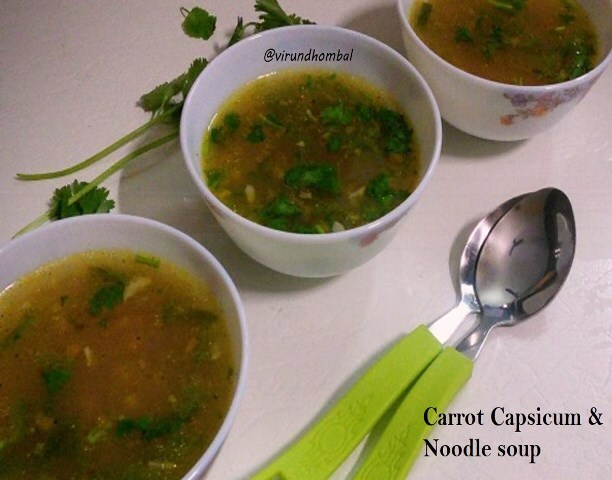 This soup is prepared with finely chopped carrots and capsicum. These vegetables require moderate time to cook and prefer to cook in sauce pan or vessel. Be careful not to overcook the vegetables. Garlics are one of the best ingredients for flavouring the soups so please do not forget to add it. I have added a handful of noodles for this soup, to attract our kids. 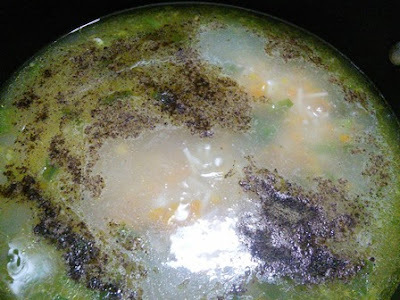 I have added little corn flour for this soup to thicken the soup but you can also prepare without any thickening agents. 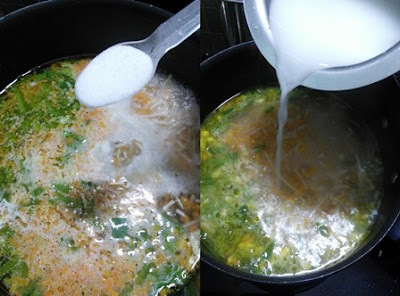 Now we will see how to prepare this easy and tasty carrot capsicum noodle soup. 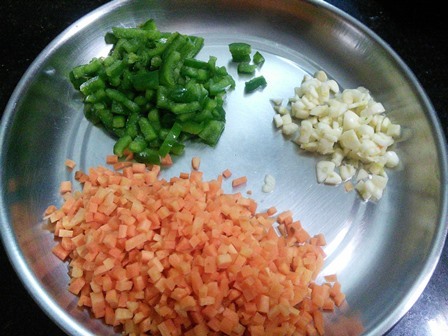 Carrot Capsicum & Noodle soup is prepared with finely chopped carrots and capsicum. 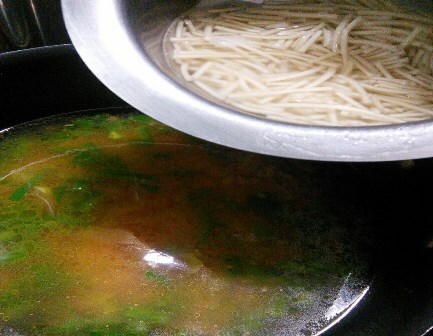 Handful of noodles are added for this soup, to attract our kids. Peel the carrots and chop it finely. 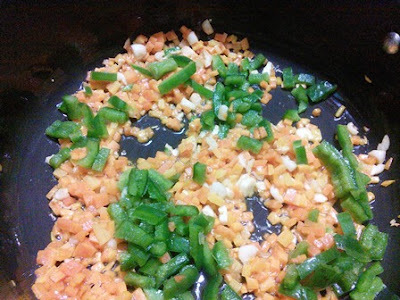 Remove the seeds in the capsicum and chop it finely. 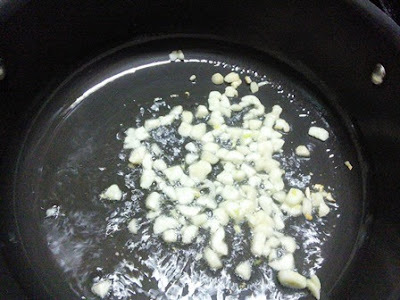 Chop or crush the garlic cloves. 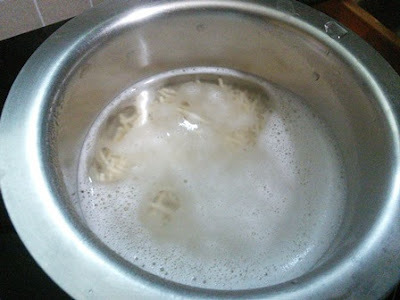 In a small bowl, boil some water and cook the noodles for a few minutes. Heat the olive oil or butter in a deep vessel or kadai and add the garlic cloves. When you get a nice aroma, add the carrots and saute them on low heat for a few minutes. 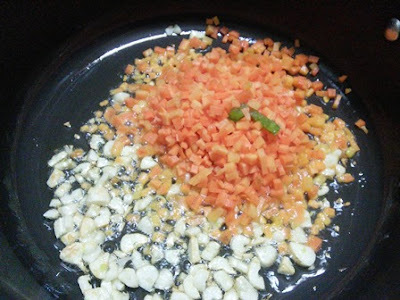 Next, add the chopped capsicums and saute for a few seconds. Now add 2 cups of water. Add the noodles and allow them to cook for 7 minutes. In the meantime, dissolve the corn flour with 1/2 cup of water. Add the required salt. Now gently pour in the cornflour extract to the soup. Add the pepper powder and cook for 3 to 5 minutes. 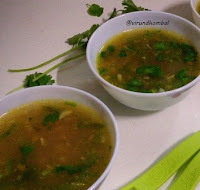 Turn off the heat and add the coriander leaves and lemon juice. Heat the olive oil or butter in a deep vessel or kadai and add the garlic cloves. When you get a nice aroma, add the carrots and saute them on low heat for a few minutes. In the meantime, dissolve the cornflour with 1/2 cup of water. Add the required salt and gently pour in the cornflour extract to the soup. Add the pepper powder and cook for 3 to 5 minutes. Turn off the heat and add the coriander leaves and lemon juice. 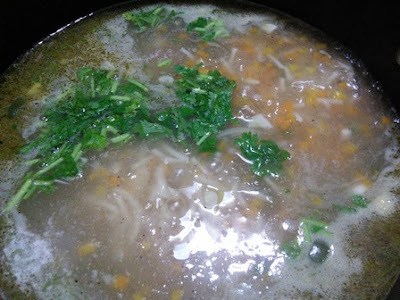 Healthy Carrot Capsicum and Noodle Soup is ready to serve. Serve it hot. You can also add chopped mushrooms, spring onion whites and boiled sweet corn kernels. Enjoy this soup with your family as a healthy starter for a weekend dinner.